How might we make the remote reading aloud experience between the reader and the child dialogic and interactive by the orchestration of the story plot, the illustrations and the projections? The child will have A3 print-out images to use as backgrounds of the story, which he will lean against the projection wall. The Storybell will project the related characters illustrations onto the specific background. At some points during the storytelling, the reader would need to prompt the child to decide how the story would go on, asking him to select among alternative backgrounds. The reader book will provide all the possible story narrations. The background illustrations have been commissioned to volunteering illustrators through an open call. Each illustrator would be given a topic to illustrate, that I considered open enough for inspiring narratives to the writer. Topics have been: the travel, the friendship and topic of the illustrator's choice. Illustrator and graphic designer from Denmark, educated from Design School Kolding in 2017. She has also studied in Canada at Emily Carr University, Art + Design. Grith is working as a freelance communication designer and is currently making illustrations for a children’s book. When working with illustration she is eager to explore new ways of telling stories by using different media, tools and styles. For the Storytellers co-creation, Grith was given as a topic “The travel” and produced 8 illustrations. Francesco Formaggi is born in Frosinone, Italy. He graduated in Aesthetics at the University of Bologna. After completing his studies, he worked as waiter, bricklayer, shop assistant, call center operator, professional trainer. He is an editor and writing teacher. He has collaborated with several literature journals, such as “Nuovi Argomenti” and “E-mood”, as well as with “West Egg editing” agency. He has been running narrative writing workshops with adults in particular social settings, such as prisons, and with children suffering from social exclusion. He has published three novels: Il casale (Neri Pozza 2013), Il cortile di pietra (Neri Pozza 2017) and Non chiudere gli occhi (Pelledoca 2017). 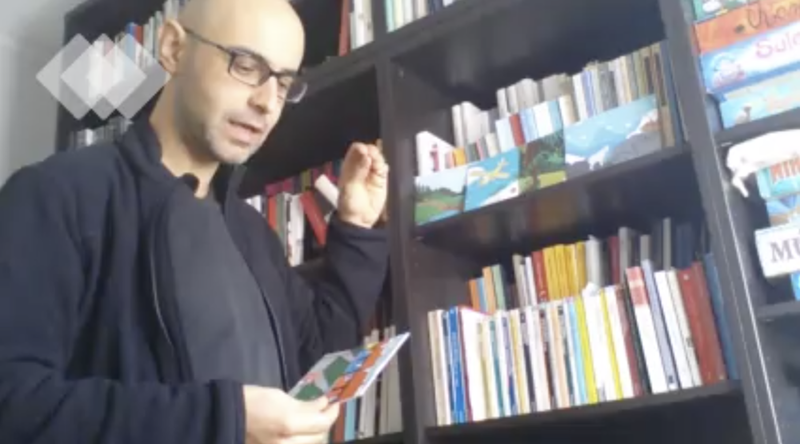 For the Storytellers co-creation, Francesco received Grith’s illustration as printed cards. After looking closely at all the illustrations, he decided an order for the cards to go through and started to improvise a story while filming himself. Then he sent me the videos in order to allow me to see how the illustrations triggered his process of story creation.